What is the primary purpose of data sharing and how do you handle it correctly? How do you involve the port community in this development? How do you guarantee the reliability of the data you work with? Which other technical, economical and legal aspects play a part? In this paper, we shall discuss the importance of a good data position for ports and increase awareness of a number of preconditions surrounding the collection, aggregation and sharing of data. 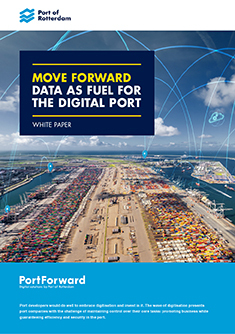 Complete the form below and receive the white paper via email and register for all updates about ports and digitisation. Please read our privacy statement to learn how we take care of your personal data. You will receive an e-mail maximum once every 4 weeks. Salutation* -- please select --Mr.Mrs.